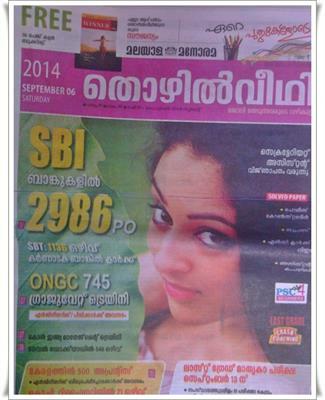 Malayala Manorama Thozhilveedhi 6th September 2014 issue (1st September) is now in stands. To read the latest issue of Malayala Manorama Thozhilveedhi dated 6 September 2014, buy a copy from your local book vendor. Thozhilveedhi from M M Group is one of the popular employment weekly which features updated news on arising opportunities in public and private sectors. Malayala Manorama Thozhilveedhi, a prominent employment newspaper in Kerala has published its 6th September 2014 edition. Like its previous issues, the current issue of 'Thozhilveedhi' is packed with rising opportunities in a wide range of fields. The most important features of this issue are the vacancies in SBI Banks, SBT, ONGC, Call India Management Training, Naval Dockyard, Apprentices in Kerala, Kochi Refineries, IGCAR, HPCL	and National Institute of Technology. Added to the various job prospects, Solved Papers of various exams and Last Grade Model Test is also featured in the latest edition. While going through the pages, 2986 PO vacancies in SBI Banks, 1136 opening in SBT, 745 graduate trainee in ONGC, Call India Management Training, 548 in Naval Dockyard, 500 Apprentices in Kerala, 71 in Kochi Refineries, 104 in IGCAR, 99 in HPCL, 74 jobs in National Institute of Technology. Candidates who are preparing for the upcoming Last Grade exam can attend the Model test. Interested candidates can attend the exam which is being conducted at various centres across the state. Complete information about the registration and details about the fees are also given in the current issue. Crash coaching for Last Grade Exam, K-TET, LP/UP, HAS, DEd & Pre Primary,/Nursery Teacher and IBPS exam are published in the 6th September 2014 issue of Thozhilveedhi. Articles on various topics including SI appointment, Secretariat Assistant exam, Last Grade Rank List and Kerala PSC Online exam are given with prominence. Readers can get the maximum benefit from the latest issue of Thozhilveedhi. 'Competitive Winner', a free booklet which contains latest General Knowledge in capsule format would serve as a companion to the readers. During the past years, this booklet has guided the candidates to score high marks and top ranks in various exams including Kerala PSC. 'Thozhilveedhi' as an employment newspaper, has delivered extreme support to the youngsters and enlightened themselves to building up a strong career. It has already established as a influential platform for job seekers. If you are a job seeker, the 6th September 2014 issue of 'Thozhilveedhi' would give you the latest updates on rising vacancies.